4 Week Countdown…4 weeks today will see us three days into our first stop – Shanghai. Although I am a fairly relaxed traveller, there is a little bit of panic starting to brew in some areas… How will I get 9,000 words of thesis done before 28 October? Have I budgeted enough money? Can anything else go wrong with the visa applications? (I’m sure it can so my fingers are firmly crossed). I’m also frantically trying to make sure that I am caring about all of the things I won’t care about once I am overseas. For example, my work will release parking permits for 2013 while I am overseas so I have crafted a cunning plan involving multiple reminders and relayed emails from work colleagues to me to Mum and Dad (I’ll fill you in later Mum). I figure that failure to do this before I leave will lead to a ‘parking-schmarking’ attitude once I am ensconced in a Ger hut in Mongolia but that I may come to regret when I have to cough up for daily parking or trek from the other side of campus for the duration of 2013. I think we’ve only faced the usual kind of hiccups so far despite ‘best laid plans’ and all that. The intention to blog once a week for the three months leading up to the trip to ensure that I am across all of the tricks and tips has obviously not occurred with the anticipated regularity… but here I am squeezing a couple of paragraphs into the last five minutes of my lunch break so that’s good enough I reckon (especially since the first draft of this was a 6 week countdown!). 1. Organise ipod… do not get stuck doing this at 4:00am on the morning of departure. 2. Learn Cyrillic or at least most of the letters (at the moment I know that cyrillic P is R, cyrillic P looks like an N and C is S… not sure how far that will get us). 3. Contact overseas CrossFit boxes to arrange drop-ins. Very excited about the idea of visiting boxes like Shanghai’s CrossFit Iron Dragon (I challenge you to find a cooler box name). 4. Do not squeal with excitement in public…especially when alone. I know it freaks people out. 1. Not to be so pre-trip frugal that I don’t buy vegetables. I know I should be super health-ing it up as the first six weeks will see me eating a lot of noodles and rice…maybe some borscht if I’m lucky. 2. Finish thesis – sad face – ’nuff said. 3. Fit in lots of CrossFit in case trip goal 3 doesn’t work out (and to try and pre-emptively counter the above-said noodles). So this is experimental becuase I am trying out the ‘Post by email’ function of the blog. So apologies in advance if the formatting etc has become revolting. The email option includes uploading photos via email so I have attached an old travel photo from New Zealand to test it out. 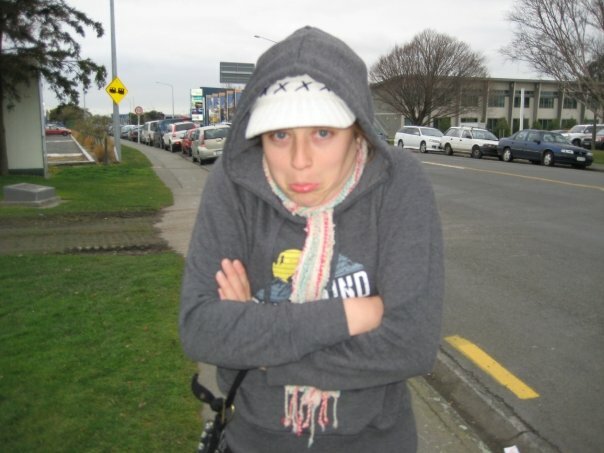 The tenuous link to this trip is that this is my cold face and I expect that it will be out a lot in Siberia! Image | This entry was posted in Travel and tagged Russia, travel. Bookmark the permalink.